Our approach to wealth management is based on a deeper understanding of what wealth is. Our unique screening approach enables you to understand the impact of your wealth on the world around you. Your ImpactDNA™ infuses your values and the passions into your wealth. We are Impact Wealth Managers. We’re committed to supporting the increasing number of wealth holders who are impassioned to take action on the issues they care about, recognising that their wealth can be a reflection of who they are. We work exclusively with clients who want to be more thoughtful about the impact that their money can make on our world to ensure it is a better place for both present and future generations. Through considered and impactful strategies for investment, we help deliver truly sustainable growth, for all. We believe that your wealth should reflect who you are as an individual. This is far more than simply building an investment portfolio. It is about creating a story. Your story. To do this, we look at investment opportunities through three lenses: our client’s values, their financial aspirations and the change they want to see in the world – their impact. We then construct bespoke portfolios that truly reflect who our clients are. We use the UN Sustainable Development Goals (SDGs) as a framework for uncovering client’s values and to measure and report portfolio performance. The Goals guide our investments and allow our clients to identify what impact they wish to create in our world. To facilitate this we have created four Tribe Themes. We go beyond the traditional approach of ‘ethical’ investments, where managers negatively screen out companies and industries that are deemed to be ‘unethical’. Instead, we actively select positive investments that directly contribute to global sustainable development and address a social, economic or environmental issue society is facing. For too long, many have believed that focussing on impact means sacrificing return on capital. As a result, traditional investment portfolios have been managed independent of impact, with those seeking it donating the income separately to philanthropic causes. We believe there is another way, where return and impact sit comfortably alongside each other in your portfolio, and further support the causes you may already be supporting philanthropically. Our clients know they can achieve a positive impact on society by investing their entire portfolio in a more responsible manner and still achieve the investment returns they require. We create a deeper, more enriching engagement with your wealth. 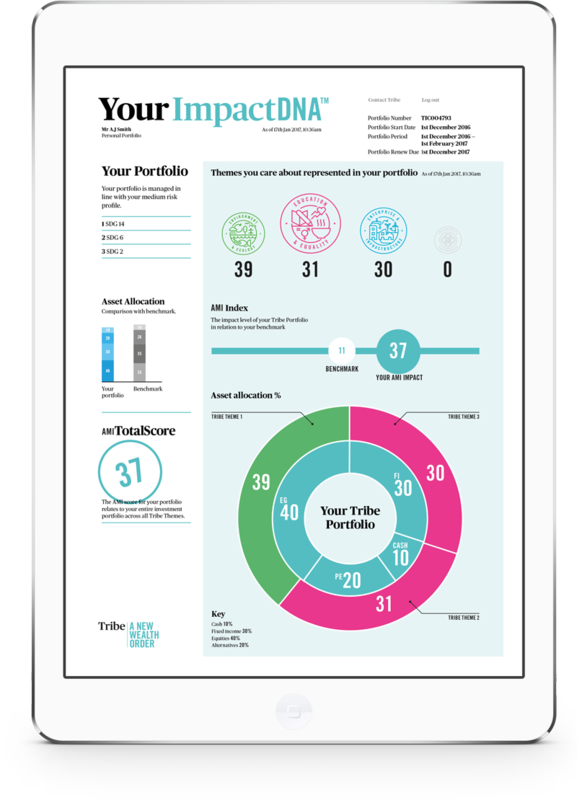 Our impact assessment and reporting allows you to understand the true performance of your Tribe portfolio. Investing has never been so rewarding. Or so personal. For illustrative purpose only and subject to change.